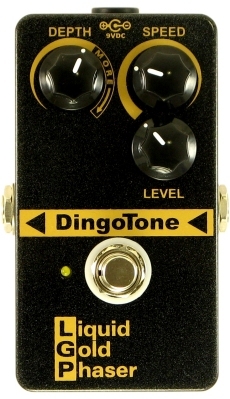 The Dingotone Liquid Gold Phaser is a 6-stage full analog phaser with up to 1080 degrees of sweep, all in a tiny pedal-board friendly housing. If a smooth vintage phaser is what you need for your rig, then look no further. If you are looking for an in-your-face phaser, a “jet” phaser, a phaser to go with your cranked Recto, or a modern noise-free studio-grade effect, then the LGP probably isn’t for you.